I respect the American flag and I fully understand its importance to a lot of people. 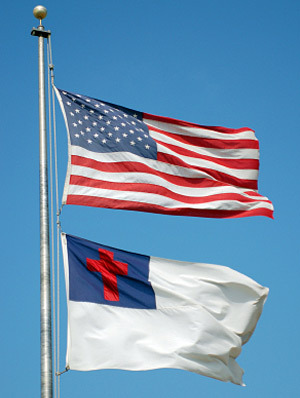 However, I stopped pledging allegiance to it a few years ago as I came to realize that to do so is a form of idolatry. Christians need to be aware of this and know just what they are doing when they pledge allegiance. Take some time and read this excellent article. This entry was posted in Uncategorized and tagged Christians, flag, idolatry, pledge of allegiance. Bookmark the permalink. God can explain to us everything we need to know about carved images, idols, and false gods, but if you don’t believe in the word of God, there is no way that God can explain it…Its like when Jesus said, love your enemies…If you don’t believe in the words of Jesus, how can you love your enemies? Well, the same is true with God, when God said, you shall not make any carved image in the likeness of anything in heaven above or in the likeness of anything in the earth below…You shall not bow down to them nor serve them Exodus chapter20..and Deuteromony 4:15-19…The founding fathers of the U.S. made carved images in the likeness of the stars of heaven above, and set the carved images of the stars in the flag to serve them…And the flag is high and lifted on a flag pole…The founding fathers made a carved image of an eagle in the likeness of the earth below, and set the carved image of the eagle in all governmental personnel service…When you pledge your allegiance to the flag, you are pledging your allegiance to the carved images of the flag, and when you serve the carved images of the flag, you are idol worshipping the carved images of the flag…The same is true when you salute the carved image of the eagle, you are idol worshipping the eagle…The mark of the beast in the right hand stands for the heart, and the mark of the beast on the forehead stands for the mind…For with the heart we believe and with the mind we serve…To avoid the mark of the beast, or any carved image, or any false doctrine, you must obey the commandments of God. Jesus said, love your enemies Luke 6:27-36…When Jesus said, love your enemies, did Jesus really meant what He said, or He really didn’t meant what He said? Theres going be a division among you, and some of you are going to say that, Jesus didn’t really meant to say, love your enemies…While some of you are going to say that, Jesus really meant to say, love your enemies…If Jesus didn’t really meant to say, love your enemies, why would He say, love your enemies? Did Jesus say, kill your enemies, or love your enemies? Did Jesus say, prosecute your enemies, or love your enemies? Did Jesus say, an eye for an eye,a tooth for a tooth, a life for a life, or love your enemies? If you kill your enemy, or if you put your enemy in jail, did you love your enemy, or did you not love your enemy? Are you going to take vengeance on your enemy, or are you going to let God take vengeance on your enemy? Romans 12:19…Jesus and His disciples laid down their lives for their enemies Luke 23:34..Acts 7:60.